On the left is a terrible picture of the new rubber feet on the bottom of my Emilia. They do keep the ratchets from hitting the table when the loom rests flat instead of with the front end hanging off the table. The second picture is of a hand-beaded sleying hook made from a paper clip. Sleying hooks are what weavers use to thread the heddles. This is a vast improvement over the plastic guitar pick that came with the loom since it actually fits in both the slots and the holes. 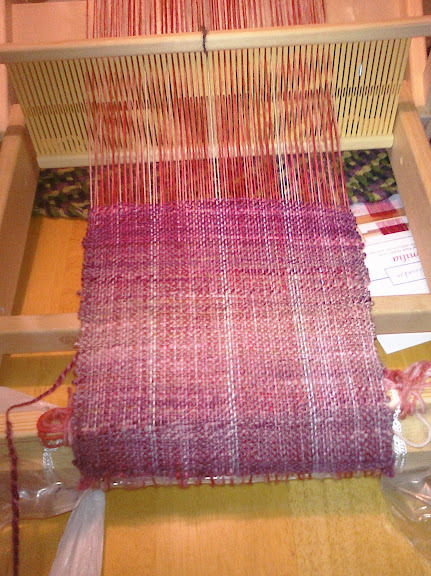 My new weaving project is warped. 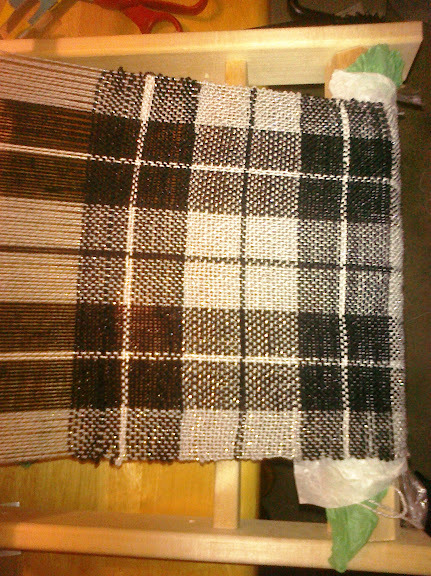 I am making a plaid from black and silver and white. I came up with a method to create warp pieces of yarn that will allow them to be individually tied on in any order. This is extremely common, and the only way to warp a regular (non-rigid heddle) loom. My method involves using my swift with two layers of pegs and a yarn path that owes something to string art. But from a swift with arms about 2 feet long, I was able to come up with a path 100 inches long using only 9 pegs. This will allow me to cut all the warp colors in advance and string them through the heddle in any order. In my first warping attempt there was slack between colors because one was tied on and the other merely wrapped around the bar. Not to mention that the physical demands of direct warping required a lot of up and down and alternated close up detail work with big motions. I found it painful to do for an hour. Using the warping board, and in my case it rotates, only requires me to sit while wrapping. Later when I am sleying the heddle, there will be a lot of detail work in a row, but hopefully the lack of alternation will allow me to find a more comfortable position for my back. The other benefit is that this does not stretch all the way across my living room and disturb my husband with me walking in front of the television. Longer warps would require more pegs (for diminishing additional lengths while increasing the awkwardness of loading) or longer swift arms. Having put my loom away for almost 2 weeks, I am almost ready to try again. My experience was so horrible the first time, but I think a lot of that has to do with being a beginner and mis-understanding the instructions. I hope that is the case. I will not need to assemble the loom again, which should prevent the heinous disaster I experienced. People at knitting group laughed when I told the story (since I meant for it to be funny, that is fine) about how I was supposed to melt the ends of the texsolv cord to prevent fraying and thought since I was only doing 4 cords, I might just use a match instead of lighting a candle. I burned my thumb, dropped the match, and set some papers on fire. Luckily I was able to blow the papers out and did not need a fire extinguisher, but you might guess that my opinion of the loom instantly dropped to a bitter negative one. Next came the actual using of the texsolv cord. In the assembly instructions, the word “loop” is used at least three different ways. You wrap the cord around the beam to make a “loop” and stick the end through one of the “loops” in the other end of the cord. Next you make a “loop” with the cord to attach the tie-up bar. But that one really meant, “Pinch a fold of the cord in the middle and put this through the hole at the loose end of the cord.” So, not only was the explanation vague to the point of incomprehensibility, it says nothing about the extremely tight nature of the texsolv cord. It was so tight that in my imagination I kept hearing the cord scream like an abducted virgin heroine in an historical romance. Accomplishing that maneuver with a burned thumb was painful. Anyway, having warped once and a half times, I should avoid the obvious pitfalls that resulted from instructions that were written “Do A B D E repeat across, oh, by the way, make sure to do C every time too.” Anyone who had warped a loom before would know C, wrap around tie-up bar, but I had no idea and had to unwarp a lot of very finicky yarn. I had problems with the warping, but the second time it mostly worked. However, layers of warp intermingled during the winding on, so my tension was wonky when I started weaving. (I did not notice during the process and it was only by reading the Ravelry group where someone else had a similar issue with wonky tension that I found the explanation. The instructions actually say that no warp wrapping is needed.) The warping is ridiculously tedious and a complete pain in the entire body. It is honestly horrible. And this is the “direct warping” that makes rigid heddle looms “so much easier” than multi-shaft looms. I warped about 9″ and cannot imagine owning a 32″ wide loom. Some of the warping and sleying (putting the yarn through the holes of the heddle) problems were because the tools provided with my loom are inefficient and completely pathetic. The “sleying hook” does not fit into the slots of the 10-dent heddle without forcing it. And the sleying hook is under 2 inches long and plastic. It is, actually, a strangely shaped guitar pick. There is no reason why what comes in the box as an “everything you need to get started” should not work together seamlessly. They probably should ship the looms with the 8-dent heddle unless they find another sleying hook that fits better. They actually recommend using dental floss threaders for the 12-dent heddle in the instructions. The other problem with the winding on is that was when the ratchets started grinding the under-surface because the instructions do not say to set the loom with the front edge hanging off of the table. These instructions give a diagram of a slip knot, but never mention anything about where the clamp that holds the loom stable is supposed to go. The clamp is not even in any of the pictures. I was mostly able to figure out what I should do based on the pictures and the fact that there is only one place to put the clamp (on the underside of the loom’s front stabilizer brace.) But if the instructions had mentioned this, there would have been a lot less destruction of the pad I had placed under the loom. I am mostly thankful that I had taken extra precautions. So I was extremely angry the whole time I was weaving the first project. Some of that was because the stick shuttle gave me splinters. How difficult would it be to actually sand a flat piece of wood? That is inexcusably bad quality control. Now I have little rubber feet from the hardware store to raise the loom up and protect the table from the ratchets if the clamp slips (which it does frequently unless you are willing to damage your table tightening the clamp) and I have come up with a way to indirect warp (where one measures and cuts the warp threads and sleys them afterward instead of during) which will save me from having to lean in to do detail work then immediately stand and walk around the room before hunching back down again. Plus I know better now. I know how to position the loom to use the clamp and avoid table damage. I know how a correctly warped loom should look. 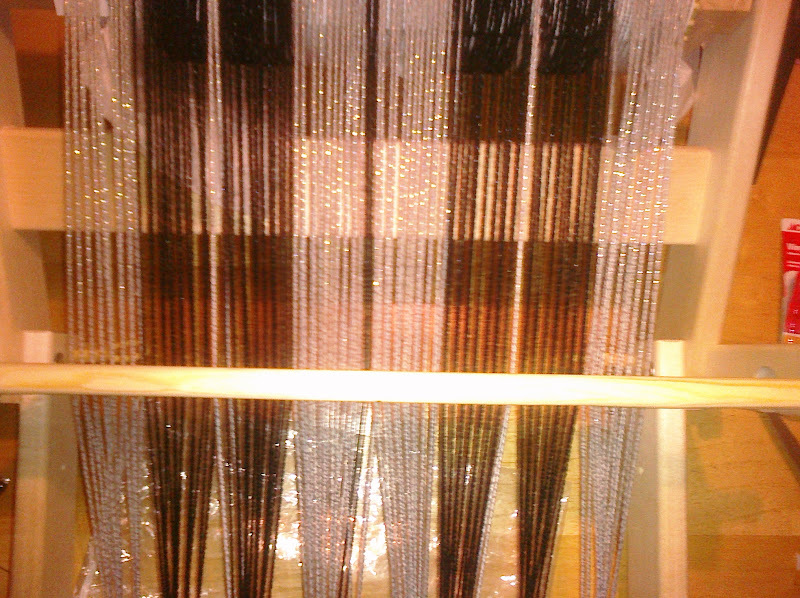 I bought some warp separating bamboo mats to help reduce intermingling the warp layers during winding on. I hated my loom because I did not have what I really needed to make it work. I lacked in experience. I lacked in understanding the directions. I hurt myself and damaged property during the assembly because of the instructions. In my opinion, corners were cut in the design choices and those choices affect the versatility of the loom (it is extremely difficult to use this loom on your lap because of the ratchets). If the lumber on the ratchet mounting sides had been wider, then the loom could be folded and stored flat on a tabletop when not in use, but that cannot happen since the ratchet teeth stand proud of the surface in every orientation. The loom does not fold up well at all, the knobs are strained when the loom is folded. The pegs holding the loom in the open configuration (it can be folded while warped) splintered the wood in their holes. The wood feels unfinished, though it might have some sort of clearcoat. It certainly is not professionally varnished for durability and long-lasting service. I feel like what came in the box is insufficient to make the product work correctly. Many of these problems have been addressed by fixing the user and aftermarket solutions. But I must heartily recommend against this loom due to the instructions, the ratchet teeth, the poor quality finish, and the lousy included tools. If this loom was $80-100 and marketed as an unfinished loom for experienced weavers, I think it would be fine. Since it is assembled, I will feel no guilt selling the loom should the second project go anything but silkenly smooth, provided I explain to the buyer how the loom should be mounted. I am still considering weaving as a potential hobby, but this is definitely why everyone keeps recommending try-before-you-buy because everyone-is-different. I will see if I can try out other rigid heddle looms in person before buying the next one. It shows how to make a flat bottomed bag from a flat pouch. My “pink zin” woven scarf is 8-9″ by 48-49″ unwashed. I want to make a functional bag from it. My sewing skills are inadequate, but I can get assistance. Comments Off on More bag ideas? There is progress with the loom. I have had a lot of adjustment issues that it really seems like should have been covered by the instructions. The instructions include a diagram of a slip knot, so why would they not show you where the clamp that holds the loom in the right position should be placed?